Questioning boundaries: How has Chinese modern art been constructed within art history? How has Chinese modern art been constructed within art history? In this essay, I would like to examine the concept of ‘modern Chinese art’, how it has been constructed, and its place within an art historical timeline. I shall begin by examining the parameters of ‘modern’ when applied to a culture outside our own, and look at how others have constructed an academic definition of modernity in Chinese art. Secondly, I shall question whether Chinese modern art deserves to be part of a global modernity, and look at the relevance and limitations of geographical boundaries applied to an area-specific art history, asking whether the idea of a ‘Chinese’ modernity is valid in a world where art historical scholarship has been created and developed in a Western world with Western terms, timelines and definitions. Finally, I shall look at the ‘art’ of modern Chinese art, and examine the idea of a modern Chinese art ‘canon’ as well as looking at ways in which it has been both constructed and arranged, to see what extent this has influenced the development of modern Chinese art as an academic discipline, and whether it can be altered. Having clarified the ‘modern’, it is now time to look at the ‘Chinese-ness’ of modern Chinese art. Is it relevant to define modern art geographically, and should we still be using geographical boundaries to define art in the face of a growing globalization? As a subject, Chinese modern art sits within the structure of a Chinese art history, but are we able to discuss it and categorize it in a broader and more global context? More specifically: if we are inevitability using Western terms and Western concepts to describe and categorize Chinese art, does this suggest that the entire creation of a Chinese art history may be uncompromisingly Western endeavour, and it is at an automatic disadvantage? Therefore, is this a word that we can usefully apply to 20th century Chinese art? Or does the meaning of the word ‘modern’ change when used in conjunction with a different society and set of cultural and political norms? Ralph Croizier argues that ‘the term ‘modern’ is particularly hard to define’.5 Is it unarguable that China had its own technological and sociological upheaval at the beginning of the 20th century, and so it would seem to make sense to agree that ‘modern Chinese art should begin after the imperial period, in the twentieth century, with the fall of imperial China in 1911.’6 However, opinions differ: for example Melissa Chiu believes that the Chinese art modernity begins with the contemporary artists in 1979, due to Deng Xiaoping’s open door policy to the West,7 while Jonathan Hay believes that Chinese modernity begins with Shitao at the end of the seventeenth century. Here I shall tentatively align myself with Croizier, who uses the term ‘modern’ to define artists who specifically ‘considered themselves modernists, bringing to China a new style and philosophy of art foreign in origin, although most tried very hard to make it Chinese in style or spirit as well as content.’8 Essentially this can be defined as artists of the 20th century who took inspiration from the West in the way they responded to the ‘modern experience’; many intellectuals believed that Chinese culture and society was suffering and that the solution would be found in Western influence; Xu Beihong and Liu Haisu proactively went abroad and sought out new methods and styles in order to bring them back to China. Artists such as Xu Beihong and Kang Youwei believed that the interaction with the more ‘reality-oriented art’ of Europe would give Chinese painting a much-needed renaissance, implying that all Chinese art that had come before was still very much ‘traditional’, and that in order to modernise one needed new artistic styles and techniques, in order to suitably respond to the complete upheaval of society in terms of urbanisation and industrialisation. Bearing this definition of ‘modern’ in mind, when discussing ‘modern’ Chinese art I shall be referring to art created between 1911 and the present day. But what is the solution? John Clark believes that it is ‘too simplistic to construct modern Asian art as an antithesis to Euramerican art,’18 particularly when we take the Chinese Diaspora into consideration: are ethnically Chinese artists who are born and raised outside China still able to be categorised as Chinese; more importantly, is their art still ‘Chinese’? If we encounter Chinese artists living and practising art in the West, how are we to classify them, and should we be even be classifying them at all? Wen C. Fong has said to Jerome Silbergeld of his research that ‘several colleagues encouraged him not to make East-West comparisons,’19 for fear of Orientalist undertones. Liu Qingping takes this even further and cites Asian scholars to be just as guilty as Western scholars in the study of Asian art history, saying that even in the twentieth century, ‘many Asian scholars often discussed various aesthetic questions according to the model of Western aesthetic tradition because the latter had been generally thought of as the birthplace and nursery of aesthetics as "a science".’ In his article ‘The Worldwide Significance of Chinese Aesthetics in the 21st Century’, he states that the differences between the histories of Chinese and Western aesthetics are so vast, that the transplanting of Western terminology and understanding onto Chinese art and visual culture will inevitably lead to ‘misinterpretations or even fatal distortions’21; in attempting to translate a foreign aesthetic into a language we understand, we risk losing meaning and ignoring context. Liu believes that the differences in Chinese and Western aesthetic traditions are represented by ‘two kinds of philosophical spirit’22, that the Chinese intention is ‘a philosophy of beautiful life’ as oppose to the Western ‘science of perceptual knowledge’.23 How can Westerners form categories for an art history that is so fundamentally philosophically different, and are Chinese art historians able to do this without being influenced by the Western nature of their discipline? However, the unforeseen importance of Sullivan’s personal collection is not entirely positive. Having acknowledged that he had no intention of building a ‘comprehensive collection of modern Chinese art’, there are downsides to his personal approach. 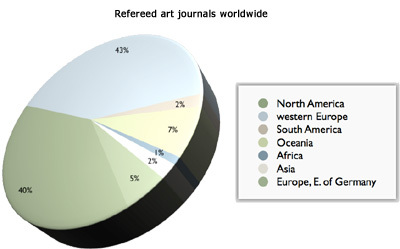 Because of its nature as a record of interactions, artists have become more or less referenced depending on their relationship with the author, resulting in a narrative where ‘people and anecdotes form the core’.27 Lu’s text also focuses on individual artists, but limited to when the artist was creating the most ‘impact’ in their career, so that ‘artistic merit was subordinate to an artist’s historical impact’.28 If we are to accept Yiu’s opinion that these two texts are still modern Chinese art’s most influential narratives, then we must acknowledge that the current Chinese modern art canon is based predominantly on specific artists. It is the honouring of tradition that led to a symposium at Seattle Art Museum in 2007, to discuss the legacy of Sullivan’s work and the ‘issues and periodization and categorization in modern Chinese painting’33, a ‘pressing issue’ in modern Chinese art due to ‘unprecedented interest in recent years.’34 In the resultant text, ‘Writing Modern Chinese Art – Historiographic Explainations’, Liu questions how works of art are chosen to represent the last century in China, particularly when the art chosen will represent only a tiny fraction of the total output. He also questions the problematic canon, asking ‘which works of art are chosen for discussion, and why? Are they chosen because of their canonical status, or do they become canonical because they are chosen for discussion? To what extent to they represent their ‘period’, however the period is to be defined?’35 There will always be scholars who differ in opinion over the importance of various works and artists, particularly in the field of modern Chinese art, which is still a relatively young discipline and as such is more malleable when it comes to new formation and structure. There is also the question of a ‘specialist’ canon, bearing in mind the names I have mentioned; authors such as James Elkins are not specialists in Chinese art history unlike those such as Jerome Silbergeld and Ralph Croizier. Will his discourses continue to be discussed in future studies of modern Chinese art, or is there an elitist structure of academics at work within the formation of the discipline? Unfortunately, the inherent structure of art history does nothing to help the cause of modern Chinese art. Since the invention of the discipline, there have been boundaries created in order to form ‘specialized’ areas; boundaries that are historiographical, geographical, stylistic, even theological. However, as mentioned in Elkins’ statistics, art history is a Western subject created by people with Western perspectives on time and space; as a result, even the most basic of art historical categories struggle to make sense on a global term. 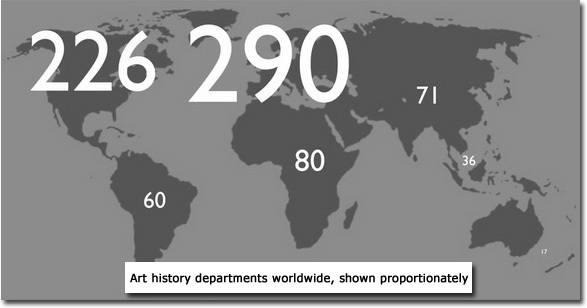 Nelson, in his article ‘The Map of Art History’, believes this is partly to do with a categorizing system, and cites Art Bulletin’s 1995 annual list of dissertations, ‘classed according to traditional categories: Egyptian, Ancient Near Eastern, and Classical Art; Early Christian, Byzantine, and Medieval Art; The Renaissance; Baroque and 18th-Century Europe; 19th- and 20th- Century Europe; Photography and Film; Art of the United States and Canada; Native American, Pre-Columbian, and Latin American Art; Asian Art; Islamic Art; African Art; African Diaspora; Art Criticism and Theory.’ This listing is not only completely nonsensical, but it is quite clearly written from a rigidly Western point of view; terms such as ‘Near East’ only make geographical sense to people who are situated in Western Europe. With these classification structures firmly in place, how are we able to introduce Chinese modern art into a global art historical canon? Until the organisation of art history as whole is addressed, it may be that Chinese modern art remains a relatively obscure and unusual field of study, or perhaps categories such as ‘Modern’ will simply expand to include a global modernity. The problem with categorization systems is that we have to decide whether to consider modern Chinese art as predominantly ‘modern’ art, or predominantly ‘Chinese’ or ‘Asian’; do we define it by its era or its geography? And does this decision apply to all modern Chinese art as a default, or is modern Chinese art produced by the Chinese Diaspora automatically organised as ‘modern’ but no longer ‘Chinese’? Will geographical classifications of non-Euramerican art result in it being viewed as an ‘other’, or is the umbrella term of ‘modern’ able to encompass a global spectrum of art due to its broad definition of ‘those who consider themselves modernists’? For those who choose to study the field of modern Chinese art, there are categories within the subject that appear to make more sense, predominantly due to the fact that most exhibitions and books follow the development of Chinese modernity chronologically. However, these are often still based on the idea of ‘movements’, so that Chinese modernity is formed into three main categories: beginning with the growing influences of the West on artists in the 1920s, when Xiu Beihong etc were returning from Paris and introducing western techniques onto Chinese subject matter, we then have the Communist and ‘social realist’ art of the Chinese Cultural Revolution, followed by ‘contemporary Chinese art’, best defined by Melissa Chiu in her book ‘Chinese Contemporary Art: 7 Things You Should Know’, which broadly manages to encompass everything from the first tentative mockings of Mao in Wang Keping’s ‘Idol’ to present-day conceptual art. Sometime the category ‘contemporary’ is actually used to specify the ‘following on’ (as it were) from modern Chinese art, yet there appears to be no specific literature that writes about the ‘death’ of modern Chinese art after the cultural revolution. If we broadly accept that ‘modern’ can still be a term applied to contemporary Chinese artwork, then within these three categories mentioned we have vital and unprecedented developments in techniques such as calligraphy and Chinese ink-wash painting, and the introduction of conceptual structures, film, video and photography. These stylistic developments, however, tend to be addressed by technique, artist, or movement, rather than being encompassed into a larger Chinese modernity. While there is much scholarship on the development of contemporary, or ‘avant-garde’ Chinese art, as it is sometimes called, it will be interesting to see how 21st century texts choose to look back on the overall development of Chinese art in the last century. To conclude, it will always be problematic when trying to make sense of an ‘other’, which is why the West is so good at creating categories and boundaries, as it believes this will help to simplify the learning and understanding. I believe Elkins and Hay are right, and that while we may mislead ourselves into believing we understand Chinese modern art by defining and categorizing it, we can only truly make sense of it when encompassing Chinese modernity into the study of a larger and more global modernity, and invite open comparisons such as Clark in ‘Modern Asian Art’. Moreover, we need to acknowledge Chinese texts on Chinese art and incorporate these into our Chinese art history canon, if we are to encourage a less Euramerican-influenced discipline. We can also consider the possibility that ‘Chinese’ artists are also part of a global modernity due to the advances in technology, but does this mean that artists have to sacrifice their cultural identity to be part of something bigger, or can they be both Chinese and global? Yiu believes that ‘recently some critics consider only works that allow for cross-cultural comparisons to be worthy of discussion and appreciation.’44 With the expanding globalization of the 21st century, this would seem to be ‘fair’ criteria, yet such art may find global success while remaining relatively unknown or unappreciated in China. Because modern Chinese art has been adopted as a worldwide market trend, there is always the demand for works that will ‘make sense’ or still seem ‘relevant’ without being seen with the contextual backdrop of China. Within the construction of modern Chinese art, this is a quietly acknowledged theme; it is still the West that drives the trends of the art market, and that has brought Chinese modernity this far.